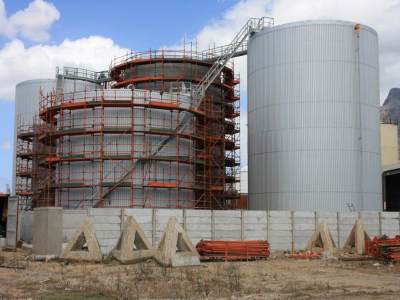 FFS Refiners (Pty) Ltd is the largest supplier of industrial heating fuels in South Africa. The Company markets products for a wide variety of uses, including glass making, brick making, steam raising in boilers, billet re-heating, baking, incineration, laundry, road-mix heating, lime kilns, sand and stone drying. FFS Refiners currently has over 250 customers who collectively consume more than 300 000 tons of fuel oil per year. The FFS Refiners Maintenance program was completed in end 2013. The project was carried out by the Rand Sandblasting Group of Companies. Rand Sandblasting was founded in 1987 offering abrasive blasting and protective coatings but soon grew into a well-established turnkey supplier in the Corrosion Protection Industry, offering services such as Scaffolding, Sheeting, Denso Wrapping, Hot and Cold Insulation, HP & UHP Cleaning, Concrete Rehabilitation and Fire Protection. The project scope entailed thermal insulation for boilers and pipelines and the natural choice was to use ULTIMATE U Thermo products. The application temperature ranged from 200 degC to 350 degC and saw over 5000 m2 of ULTIMATE U Thermo Matt and 1000 LM (linear meters) of ULTIMATE U Thermo pipe being used.